Image source: Sandra Plummer Collection, Fort Worth Library Digital Collections. Colorized courtesy of Algorithmia. This article continues Batangas History’s series on the operations of the United States Army in Batangas in 1901-1902 during the Philippine-American War. The information contained herewith is extracted from the Annual Report of the United States War Department1. The report contains snippets of information arranged in chronological order. 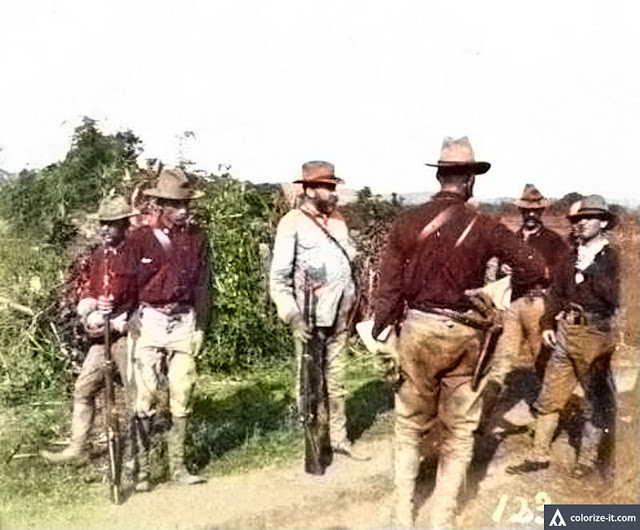 One Major, One Captain, two 1st Lieutenants of the Filipino rebel force (presumably under the command of General Miguel Malvar), carrying with them 7 Remingtons2, 1 Mauser3 and 50 cartridges surrendered to 2nd Lieutenant W. H. Bell Jr. of the 1st Cavalry. A detachment of 17 men en route from the town of Lipa to Tiaong in Quezon was fired upon by a group of some 50 rebels in a barrio Palita in Alaminos, Laguna. Sgt. Henry Waring was slightly wounded in the calf. American forces were involved in an encounter with Filipino rebels in Tanauan, Batangas. The rebels were well entrenched and enjoyed a favorable position. They tried to draw part of the American forces out of position but were subsequently outflanked. The Americans were under the command of one Captain Harry C. Hale. In all, 11 of the rebels were killed while 9 were captured, including 3 wounded. 15 serviceable rifles were also taken. One Colonel Loriel of the Filipino rebel forces, accompanied by 17 of his officers and carrying 47 rifles, surrendered to one Colonel Frank D. Baldwin of the United States Army in Talisay, Batangas. Two schoolers named Narced and Caysasay carrying crews of 9 and 10 men, respectively, were captured off Maricaban Island in present-day Tingloy and brought to the town of Batangas. The boats were believed to have been carrying on an illegal trade with Mindoro. General Miguel Malvar was almost captured in an encounter with an American force consisting of 50 men under the command of Captain Harry C. Hale in the foothills of San Bartolome in Santo Tomas. Hale’s group would be reinforced by the 1st Cavalry under Captain Jacob G. Galbraith and the 20th Infantry under Captain Morton F. Smith. The Filipino rebel force was some 350-strong but were driven over the mountains in the direction of Calamba. Several of the rebels were believed killed or wounded and 15 of their rifles were captured. The Americans reported that some were badly frightened and were throwing away rifles. A detachment from the 20th Infantry under Captain William S. Graves, with a detachment from the 1st Calvary, captured four adjoining barrios in Santo Tomas along with four rebel soldiers and a Remington carbine rifle. A group of some 15-20 Filipino rebels a patrol of three men of the 20th Infantry of the US Volunteers on the Lipa Road in San Galo (probably in the Malvar-Balete area) heading towards Taal Lake. The attack sent the rebels scattering in all directions, leaving behind their food, clothing and ammunition. In Calapan in the island of Mindoro, Filipino rebels under the command of one Colonel Atienza, encountered troops of the 13th Infantry of the United States Volunteers. The rebels were scattered, but unbeknownst to them, information about their movements were obtained by the Americans from the Presidente4 of Taal, a gentleman named Ylagan, who was under their custody. A detachment of the 21st Infantry commanded by one 2nd Lieutenant Allen T. Crockett struck a battalion of Filipino rebels in a barrio of Lipa, Batangas. Two rebels were confirmed killed as their bodies were recovered. The battalion cuartel (or barracks) was destroyed and 4 Remington rifles were captured by the Americans. One Major Toribio Natividad, accompanied by two sergeants belonging to the Colonel Juliano Command, surrendered in Tanauan, Batangas. They turned over to the Americans 10 rifles and 60 rounds of ammunition. Three Filipino rebel lieutenants were captured in Santo Tomas by a group of soldiers under the command of 1st Lieutenant Samuel L. Gleaves of the First Cavalry. American soldiers from the 21st Infantry under the command of one 1st Lieutenant Chase Doster surprised a group of Filipino rebels commanded by one Mariano Libres near barrio San Benito in Lipa, Batangas. One Filipino lieutenant was killed and four other rebels were wounded. Eleven prisoners were brought in and with them, 11 rifles, 70 rounds of ammunition per rifle, 2 Mausers and 2 Remingtons. One rebel officer called Captain Titi 😀 was captured in Taal by a detachment from the 6th Cavalry under the command of one 2nd Lieutenant Olney Place. Two native bull carts carrying fresh meat from Calamba and bound for Lipa, along with their drivers, were captured near by a band of some 20 Filipino insurgents. A detachment from the 1st Cavalry was sent in pursuit of the rebels and found near the foot of Mount Makiling a cuartel and storehouse belonging to the rebels. These, the Americans promptly destroyed. 2 Presumably rifles. “Remington Arms,” Wikipedia. 3 Mausers were German-made pistols issued to the German Armed Forces in the late 19th century. Wikipedia. 4 President was the equivalent of the present day town or city mayor.